PARIS – Pro-European centrist Emmanuel Macron promised Sunday to heal France’s divisions after crushing far-right leader Marine Le Pen in a pivotal presidential election that has given him a large but fragile mandate for change. At 39, the pro-EU former investment banker will become France’s youngest-ever leader but faces a huge challenge to enact his programme while trying to unite a fractured and demoralised country. "I will fight with all my strength against the divisions that are undermining us," Macron said in a solemn address at his campaign headquarters. Almost definitive results showed Macron winning 65.82 percent of the vote in the first ever election he has contested, far ahead of the nationalist Le Pen at 34.18 per cent. But in a sign of widespread voter disillusionment, one in three voters abstained or cast a blank ballot. Western leaders largely hailed the result after the shock of Britain’s vote to leave the EU and the election of Donald Trump in the United States. Macron reached out to Le Pen’s supporters in a plea for unity after a vicious election campaign that exposed deep economic and social divisions, as well as tensions provoked by identity and immigration. "They voted out of anger, distress and sometimes conviction. I respect them," he said. "I will do everything I can over the next five years to ensure that people no longer have any reason to vote for extremes." Macron walked on to the stage to the strains of "Ode to Joy", the anthem of the beleaguered European Union that he has promised to help overcome the wounds of Britain’s impending exit. His 64-year-old wife Brigitte, who he wooed when she taught him drama at school, joined him on stage with her children and grandchildren. "He’s a symbol of hope," said Jean-Luc Songtia, a 36-year-old driver. "It’s like Obama eight years ago. It’s youth, it’s hope." Unknown three years ago, Macron is poised to become one of Europe’s most powerful leaders, bringing with him a hugely ambitious agenda of political and economic reform for France and the EU. The result will resonate worldwide and particularly in Brussels and Berlin where leaders will breathe a sigh of relief at the defeat of Le Pen’s anti-EU, anti-globalisation programme. German Chancellor Angela Merkel’s spokesman said it was a "victory for a strong and united Europe" and the two had a "very warm" telephone call after his victory was announced, Macron’s team said. EU Commission President Jean-Claude Juncker said French voters had chosen a "European future." British Prime Minister Theresa May discussed Brexit with Macron in a call to congratulate him late Sunday, saying "the UK wants a strong partnership with a secure and prosperous EU once we leave", her Downing Street office said. Trump, whose beliefs are seen as radically different to Macron’s, tweeted congratulations on a "big win" and said he looked forward to working with him. The euro rallied to a six-month high against the dollar in Asian trade and other financial markets are expected to react positively. "It is a big victory for a part of the population – and there are many of them – who identify closely with Europe and a certain vision of globalisation," veteran political analyst Philippe Braud said. The French election had been widely watched as a test of how high a tide of right-wing nationalism would rise after Brexit and Trump. Le Pen, 48, had portrayed the election as a contest between Macron and "globalists" – those in favour of open trade, immigration and shared sovereignty – and her "patriotic" vision of strong borders and national identities. In a short speech to supporters, Le Pen claimed a "historic, massive result" and said she had called Macron to wish him "success" in tackling the country’s challenges. She said her National Front (FN) needed to undergo a "profound transformation" ahead of parliamentary elections in June. One of her aides said the party will change its name. Macron must tackle formidable challenges as he attempts to enact his domestic agenda of cutting state spending, easing labour laws, boosting education in deprived areas and extending new protections to the self-employed. The philosophy and literature lover is inexperienced, has no political party and must fashion a working parliamentary majority after legislative elections next month. His En Marche movement – "neither of the left, nor right" – has vowed to field candidates in all 577 constituencies, with half of them women and half of them newcomers to politics. "In order for us to act, we will need a majority in the National Assembly," En Marche secretary general Richard Ferrand told TF1 television, adding that only "half of the journey" had been completed. 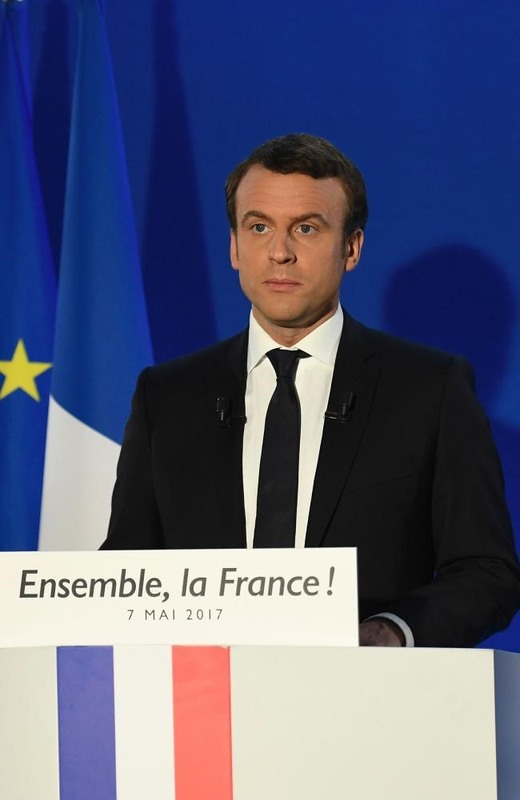 Many analysts are sceptical about Macron’s ability to win a majority with En Marche candidates alone, meaning he might have to form a coalition of lawmakers committed to his agenda. Furthermore, his economic agenda, particularly plans to weaken labour regulations to fight stubbornly high unemployment, are likely to face fierce resistance from leftist opponents. He also inherits a country still in a state of emergency following a string of Islamist-inspired attacks since 2015 that have killed more than 230 people. His first ceremonial duty comes on Monday when he appears alongside outgoing Socialist President Francois Hollande in Paris to commemorate the Nazi capitulation on May 8, 1945. Macron won after one of the most unpredictable elections in modern history marked by scandal, repeated surprises and a last-minute hacking attack on his campaign. Hundreds of thousands of emails and documents stolen from his campaign were dumped online on Friday, leading the candidate to call it an attempt at "democratic destabilisation." The election saw voters eject establishment figures, including one-time conservative favourite Francois Fillon.